I have finally got around to adding some of my cloud computing economics research in Wikipedia’s cloud computing article. I tried to maintain a neutral point of view but there’s not really a bad thing to say about cloud computing when it comes to economics. I also realised we hadn’t yet talked about cloud computing with the oh-so-common electricity utility analogy and as Wikipedia likes analogies for technical content this addition is probably long overdue. I’m sure the diagram in particular will prove useful and as such I’ve made it available under a Creative Commons Attribution ShareAlike 3.0 license at the Wikimedia Commons: Cloud computing economics.svg. As it’s in Scalable Vector Graphics (SVG) format you can scale it up to poster size with no loss in quality and most browsers support it natively now. The MediaWiki software can also render a PNG version for you if you prefer. As usual it was created using the excellent OmniGraffle software, but I use open source Inkscape and Adobe Illustrator sometimes too (all of which export to SVG). Without further ado, here’s the new section (but it may look quite different by the time you get to it… here’s a link to the current revision. 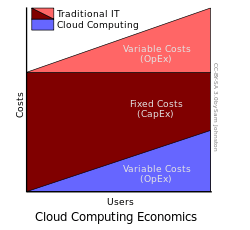 Cloud computing users can avoid capital expenditure (CapEx) on hardware, software and services, rather paying a provider only for what they use. Consumption is billed on a utility (e.g. resources consumed, like electricity) or subscription (e.g. time based, like a newspaper) basis with little or now upfront cost. Other benefits of this time sharing style approach are low barriers to entry, shared infrastructure and costs, low management overhead and immediate access to a broad range of applications. Users can generally terminate the contract at any time (thereby avoiding return on investment risk and uncertainty) and the services are often covered by service level agreements with financial penalties. According to Nicholas Carr the strategic importance of information technology is diminishing as it becomes standardised and cheaper. He argues that the cloud computing paradigm shift is similar to the displacement of electricity generators by electricity grids early in the 20th century.